TSGENCO JAO Junior Accounts Officers Recruitment 2018, Apply Online: Telangana State Power Generation Corporation Limited (TSGENCO), Hyderabad has issued the Junior Accounts Officers Recruitment 2018 notification. Applications are invited through On-line from the eligible candidates in the proforma. 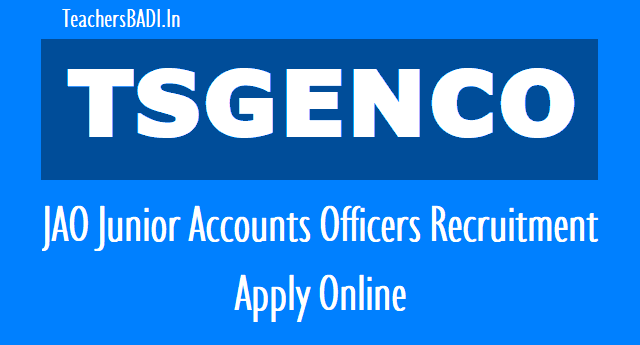 Application which is made available on TSGENCO WEBSITE www.tsgenco.co.in and http://tsgenco.cgg.gov.in to the post of “Junior Accounts Officer”. Qualification: First Class M.Com. Or B.Com First Class. Or Pass in IPCC (formally known Intermediate) of the Institute of Chartered Accountants of India. Or Pass in Intermediate examination of the Institute of Cost Accountants of India.